Japan has a long and distinguished history of popular visual cultural forms. Modern manga (graphic novels) and anime (animated stories) draw upon the great woodblock traditions of 18th and 19th century Japan (which in turn drew from much earlier Japanese art traditions). The manga that have become known internationally largely developed in Japan after 1945 and represent an entertainment and art form drawing on globalising popular culture adapting traditional Japanese visual traditions and stories. Anime, which really took off in the 1960s, similarly draws on aspects of Western animation but in distinctively Japanese ways. Many anime are adapted, sometimes quite radically, from successful manga. The important point is that manga are read by all kinds of people in Japan with estimates of up to 40% of all Japanese publishing being devoted to manga. There are manga for all kinds of readers and some manga are unique and radical in their appeal to readers. The same is true of anime. Although many anime are made relatively cheaply as TV series, some, especially those from Miyazaki Hayao’s Studio Ghibli have been the biggest box office films in Japan over the last twenty years. 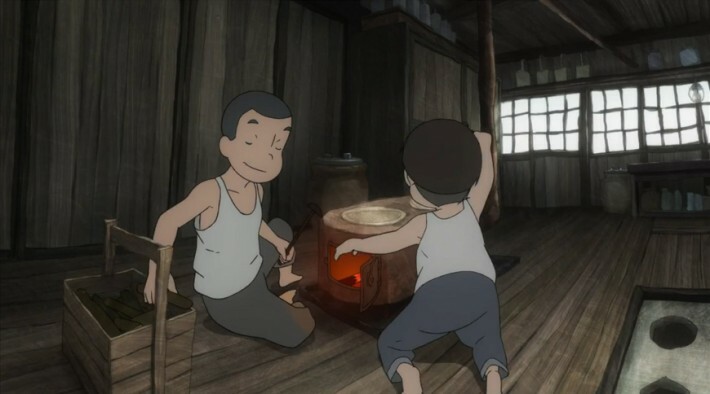 Like the Miyazaki films, Giovanni’s Island is essentially a story told from a child’s perspective, but one that explores serious philosophical ideas. Inevitably, anime are compared to Hollywood animations (Disney is the distributor for Studio Ghibli in the West). In technical terms anime are low budget with a lower frame rate producing jerkier motion and a drawn animation style that is less ‘realist’ and more closely linked to traditional drawing styles. For many fans, anime are more beautiful than similar Hollywood creations as well as more dramatic and challenging. The period of Allied Occupation from 1945 to 1952 had a traumatic effect on Japanese culture and society. Many films deal with the problems of returning soldiers, the women who had stayed in Japan, ‘repatriated’ colonial families, poverty and starvation, the black market, the impact of American GIs and American culture etc. The Allied fire-bombing of cities and the atomic bomb attacks are represented symbolically and several films focus on stories about children in the devastation after 1945. Giovanni’s Island draws on many of these ideas. The story takes place on Shikotan Island in the South Kurils. The Kuril islands form the long archipelago between Hokkaido island in Japan and the Kamchatka peninsula of Russia. After the Russo-Japanese War of 1904-5, Japan controlled the southern half of the large island of Sakhalin close to the Russian coast (referred to as Karafuto in the film) and all of the Kuril Islands. The film is accurate in terms of the events depicted. Soviet forces took control of the whole archipelago in 1945 and eventually all the Japanese inhabitants were expelled. Japan still claims the four main Kuril Islands, including Shikotan. The film’s title refers to a children’s fantasy novel, Night on the Galactic Railroad by Miyazawa Kenji written after a railway trip to Sakhalin while the author was mourning his sister’s death. The novel has a religious/philosophical theme about self-sacrifice. It has been adapted several times as the basis for manga and anime. The Galactic Railroad links the two boys to their father and also to Tanya. Another juvenile novel was adapted as one of the most famous and successful Japanese films of the 1950s, The Burmese Harp (1956), in which Japanese soldiers in Burma in 1945 discover that they and their British captors enjoy singing the same song (‘There’s No Place Like Home’). This film, like Giovanni’s Island demonstrates a certain kind of humanism in which the victors and the defeated share aspects of popular culture. Japan had become more open to ‘Western’ culture in the 1920s and 1930s and in Giovanni’s Island popular songs (the Russian one later became a UK pop hit as ‘Those Were the Days’ in 1968) and the model railway provide the means to share. More details of the film on Anime Network.